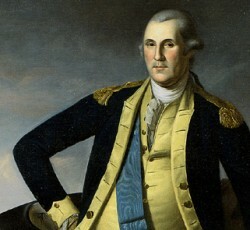 George Washington didn’t win the Revolutionary War because he had a superior fighting force. It was a ragtag army that was always in danger of either being wiped out by an engagement with British forces, or evaporating when enlistments were up. He didn’t win the war because his army was better equipped. In fact, many of Washington’s soldiers lacked the basic necessities of life including shoes and it was always a challenge to keep the a rmy fed. Washington’s lies: In a new book entitled “George Washington’s Secret Spy War: The Making of America’s First Spymaster” (St. Martin’s Press, 2016), author John A. Nagy argues that Washington won the Revolutionary War because he was smarter and cagier than the British generals he fought against. The book tells the story of the War through the filter of Washington’s spy strategies and tactics, something often overlooked in recounting the victories and defeats of the War. For a man whose reputation as an upright and honest man has been passed down through the generations, it is surprising to learn that Washington practiced lying and deception on a regular basis throughout the eight years of the war for independence, and that he was actually very good at it. With headlines and congressional investigations into whether Russia interfered with the 2016 presidential election with fake news and hacking, the book is a helpful reminder that foreign espionage and spying are not new but have been around for a long time. Faking out the French: Washington learned how to lie and deceive well before the Revolutionary War. As a young man engaged in the French and Indian War, he learned the basics of spying as a military tactic to ensure success. He became a spy himself. He often traveled at night to prevent detection. Once he fell into the frigidly cold Allegheny River while attempting to cross it. Long before fake news hit the headlines, Washington became a master of fake information, disseminating fake news to the Indians about the French plans. And because he often didn’t trust the Indians, suspecting them of being disloyal, he gave them false information about his planned movements against the French, knowing that the information would get back to the French and put them at a disadvantage. Double agents: One of Washington’s challenges, not only during the French and Indian War, but in the Revolutionary War was what spies and information should he believe as true. He knew there were countless double agents or counter spies who worked for both the British and colonists. And so Washington always faced the problem of finding trustworthy spies. Even some supposedly stalwart Americans, such as General Benedict Arnold, were secretly working to aid the British. Sometimes, these double agents were motivated simply by money, and Washington constantly had to raise the necessary funds to pay the spies in gold and silver. It was a risky venture being a spy since the consequences of being found out and captured were a matter of life and death, and so the spies had to be paid well. Many times, Washington would write to those under him to spare no expense in procuring the best spies. Washington also had to be savvy in coping with Loyalists to the crown who couldn’t be trusted. Trust and verify: To counteract against the threat of double agents, Washington would try to verify any information he received from two or three sources to reduce the risk of being led astray by a double agent. He also had to sort through the information he received to determine if it was true or if the British were also engaged in a disinformation campaign to lead him astray. And then, of course, he had to interpret the information he received (if he thought it was true) to assess what it actually meant. For example, he asked his spies to observe whether the British troops were eating precooked meals or whether the they were cooking their own rations. Precooked meals might be an indication that an attack or an expedition was imminent and that the troops didn’t have time to cook. Hacking of letters: In our world today of email hacks where we have an expectation of privacy, delivering a letter in Washington’s times came with no expectation of privacy. It was assumed that any letter was not private and would be intercepted, opened, read, and then maybe resealed and delivered. Washington understood the risk and so sometimes he would write only very brief and non-revealing letters, telling the recipient that he would tell them more when they met in person. Another strategy employed by both Americans and British during the Revolutionary War was to use invisible ink that only showed up when put next to a heat source or to write in cipher code. Once either side cracked the code, however, any intercepted letter was fairly simply to read. Book review: While the book (“George Washington’s Secret Spy War: The Making of America’s First Spymaster”) does a good job in presenting a lot of very detailed research information, the information is often too detailed and is not set in appropriate context. The writing style often becomes a victim of the details, is uneven, and frequently fails to present a flowing and compelling narrative story that demonstrates why the details are important. The readers senses at some points that the author, having discovered certain facts, simply had to include them but he often fails to set the context and doesn’t interpret the facts. The detailed information is interesting (at times), but it is often not grounded in the broader story of the Revolutionary War. Furthermore, the book contains all too frequent repetition, sometimes word for word within a few pages. 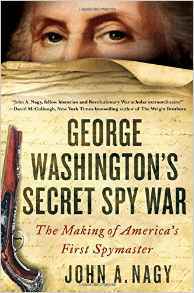 While the book doesn’t tell the story of the Revolutionary War through the filter of spying and counter-spying in an engaging and cohesive manner, it does provide new information and a new appreciation for Washington’s challenges and the strategies he employed to win the war.